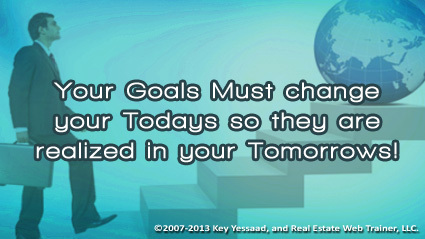 The main purpose of having Goals is that they allow you to alter the Present (Your Now) to fit and mold your future – ponder this thought for a little while. If your definition of the future is you flow with whatever happens then do not need have any goals – just flow dud! You are not trying to Change the future by looking at the future – you are trying to change your ‘Now’ so your future becomes the way you have designed it! The truth of the matter is what some call Goals are at best called Wishes and Hopes; they are imaginations that have no thread to the present or to reality. Real Goals will force you to look at yourself anew, push the boundary of your comfort zone, and force you to live a more authentic life then you have so far. The thread that connects the results of your future Goals, with today’s Habits are your planned activities, followed with review and assessment. Are you planning methodically or are you hoping the future is a poker game you play in a Vegas Style Casino, crossing your fingers for a killer hand?